Are you getting the best sleep you can? If you can't answer yes to this question, it may be time to look for a new mattress. Even if you think you might be getting good sleep, if you're tossing and turning during the night or you're waking up still feeling tired, it's time to toss the old coil mattress and purchase a new mattress that's designed to help you get better sleep. You may not even realize how much more comfortable you can be when you sleep on a mattress that's designed especially for your comfort, like a gel infused memory foam mattress. 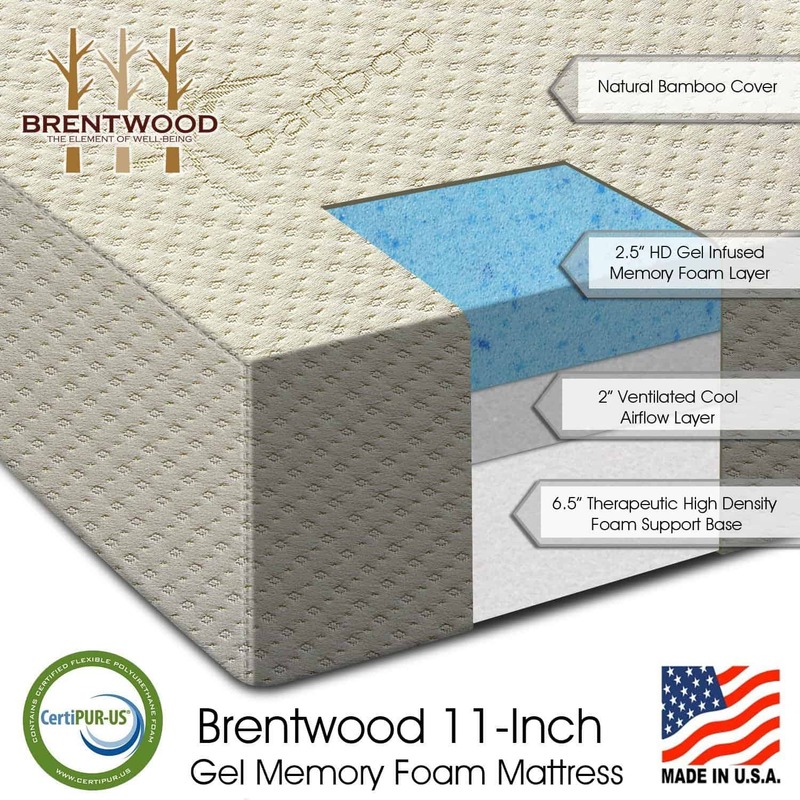 One mattress you may want to consider is the Brentwood 11″ Gel Infused HD Memory Foam Mattress . This mattress comes in a variety of sizes including twin, twin XL, full, queen, king and California king, so there's a size that's perfect for everyone. It's made up of 3 different layers. The bottom layer is a 5 inch high density foam supportive base. This gives you the support you need throughout the night. The middle layer is 2.5 inches and it's a memory foam support layer, adding even more support to help you get a restful sleep. The top layer is what makes you comfortable and relieves pressure points while you're sleeping. This layer is 2.5 inches and it's an HD gel infused memory foam layer. The cover is made from natural bamboo fibers, designed to keep you cool and comfortable. This gel infused memory foam mattress is a medium firm mattress, meaning it's the perfect mattress for the majority of people. It offers enough support, while at the same time allowing you to be completely comfortable for the best sleep. The two bottom layers are meant to be highly supportive, while the gel layer on top conforms to your body. The Brentwood mattress features gel infused memory foam which is designed to not only keep you comfortable, but keep you cool as well. It's specially formulated to ensure that the foam helps your spine align correctly whenever you're laying down. It also features a removable bamboo cover so you can easily wash your cover whenever necessary. It's made in the USA and is easily shipped because it is compressed to make it smaller. Once it's delivered, it will easily expand to the correct thickness and be ready for you to sleep on in no time. It's also hypoallergenic and dust mite resistant, meaning you don't have to worry about allergies with this mattress like you would with older mattresses. It's also anti-microbial, so you don't have to worry about germs on the mattress. This mattress has a 25 year warranty, which means you can have it repaired or replaced if there are any manufacturer defects in the mattress up to 25 years after purchase. This mattress is rate 4.7 out of 5 stars by over 90 reviewers. The majority of reviewers are very satisfied with their purchase and are loving the restful sleep they're enjoying every single night. In fact, with only 2 1-star reviews and no 2-star reviews, this mattress is highly preferred and has a high chance of being the perfect mattress for you as well. This Brentwood 11″ Gel Infused HD Memory Foam Mattress Review is meant to show you all of the ways a gel infused memory foam mattress can be the best mattress you'll ever sleep on. If you're interested in learning more about this type of mattress, you can try one out today or order your new mattress online. Then, snuggle up in your favorite pajamas and get ready for the best sleep you've ever had. No more tossing and turning, and you'll wake up in the morning feeling refreshed and ready to start the day. If the reviews are anything to consider, it's highly likely this is going to be the perfect bed for you, like it is for many other people.